We introduce two ways to transfer GoPro video to iPhone. You can either import GoPro video file to iPhone with iPhone file transfer software or download GoPro footages to iPhone wirelessly with GoPro Capture app. iPhone transfer software can sync up to 8K/4K/VR high resolution and large GoPro videos to iPhone quickly without limits, while Capture app from GoPro is suitable for sending low resolution GoPro video files in small size to iPhone without computer. Read our tutorial below to learn how to sync GoPro video to iPhone easily for sharing, editing or playing on the go. Two clicks to transfer large GoPro videos (8K/4K UHD/1080P) to iPhone Xs Max/Xs/XR/X/8/7/6s/Plus quickly with MacX MediaTrans, a solid iOS syncing tool. Auto convert unsupported GoPro video to MP4 (H.264) format for iPhone. Also import GoPro photos to iPhone iPad iPod. Some choose to import GoPro video to iPhone wirelessly with Capture app, but it is not the quickest way and has lots of problems like slow speed, unsupported file type error, 4K UHD large GoPro video not synced. Here we introduce MacX MediaTrans, a robust iPhone file transfer & manager software. It boasts many great features you can't find in Capture app or other iOS file transfer applications. Two clicks to sync GoPro videos to iPhone with No.1 fast speed. Support to import 720P/1080P/4K UHD/5.2K/8K VR video files from GoPro cameras to iPhone smoothly without stuttering. Download footages, and clips shot by any GoPro models (HERO5, HERO4, HERO Session, HERO+ LCD, HERO+, HERO3+ and more) to any iPhone models XS/XR/X/8/7 (Plus). Auto convert and transfer unsupported videos from GoPro to iPhone video format MP4 (H.264) and auto rotate video if necessary. Also import and export GoPro photos to iPhone, iPad, iPod and many other types of media files like music, movies, books, ringtones, documents etc. Step 1: Launch MacX MediaTrans if you've downloaded it for Mac or for Windows. Connect your iPhone with computer using USB cable and also connect your GoPro camera with computer. Step 2: Click "Video" on the main interface to get access to import GoPro video to iPhone. Step 3: Click "Add Video" on the Video window, and it will give a window to select files to transfer. 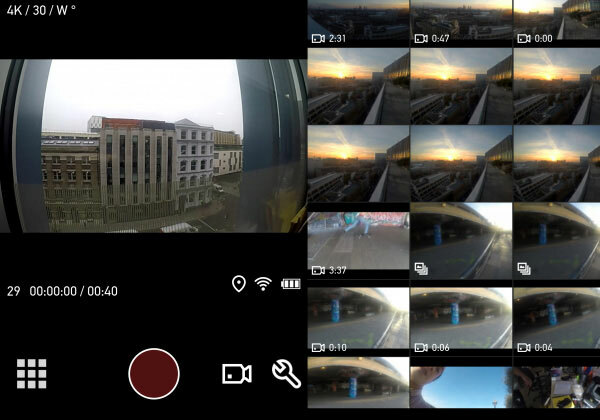 Head to your GoPro video folder and choose video files you want to export to iPhone. The software supports to transfer GoPro video to iPhone in batch. Finally, click on "Sync" to start importing GoPro footages, clips, videos to iPhone for viewing, editing or sharing. Also check out the guide on how to edit GoPro videos. It's the same to sync GoPro videos to iPad and transfer GoPro photos to iPhone, iPad, iPod. Capture, one of the most helpful GoPro apps, can be used to import GoPro video to iPhone wirelessly without using computer. It's very easy. Just follow steps below to sync GoPro video to iPhone via Capture app for iPhone. Note that you can only transfer GoPro video to iPhone running iOS 9 or later. Capture app compatible GoPro cameras are HERO5, HERO4, HERO Session, HERO+ LCD, HERO+, HERO3+, HERO3, HERO3, HD HERO2. Step 1: Before you download GoPro video to iPhone, go to visit GoPro apps site, find out and download Capture app to iPhone, launch it. Step 2: Turn on your GoPro WiFi. Go to Settings on GoPro, click "WIRELESS CONTROLS" and choose to turn WiFi on. Step 3: Connect your iPhone to your camera's network, and re-launch GoPro app on iPhone. Step 4: Select "Connect & Control" on GoPro app on your iPhone. Step 5: Click Tumbnails to view videos on GoPro camera, and you'll see Edit button on the top right corner. Step 6: Click "Edit" button and get ready to transfer GoPro video to iPhone. Learn how to free up iPhone space if you don't have storage to save GoPro videos. Step 7: Click on the upload button on the bottom left corner, a window will show up asking you if you want to copy video to iPhone with low resolution (faster) or high resolution (slower). Select a mode and start to move GoPro video to iPhone Cameral Roll or GoPro album. The guide also works or downloading GoPro videos to iPad, Android phones and tables. It's quite the same to import GoPro photos to iPhone, iPad, Android mobile devices with Capture app. 1. 8K/5K/4K UHD GoPro video or video with large file size cannot be transferred to iPhone using Capture app. 2. Slow GoPro video to iPhone transfer speed or transferring cannot be completed. The transfer speed and the time it takes also depend on your Wi-Fi connecting speed, as well as the file size. You are suggested to compress GoPro videos or choose to import GoPro video to iPhone with low resolution. 3. Failed when downloading GoPro video to iPhone, video not supported or can't load video in GoPro Capture app. You need a GoPro video converter to change video formats. Also check out best video format for iPhone. Free download the solid iPhone transfer and manager - MacX MediaTrans to quickly sync GoPro videos up to 8K/4K UHD to iPhone in batch quickly without stuttering. Also auto convert GoPro videos to MP4 format for iPhone. No file format and file size limit. Can't Add Movies to iTunes? How to Sync Movies to iPhone?